Step right in to the embroidery boutique! 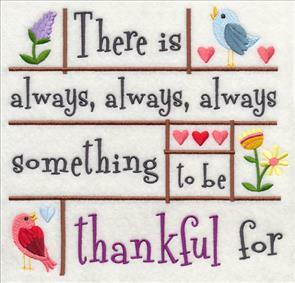 Today you'll find a fantastic variety of designs, ready to add a fresh and fun look to your projects. 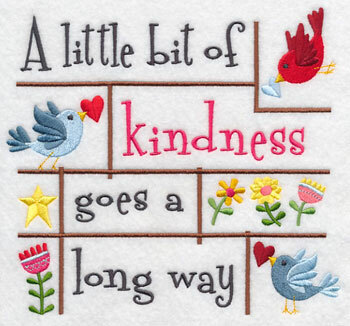 Warm words of wisdom in country-style shadow boxes, sweet tweets carrying colorful autumn flowers, light-stitching tea sets decorated with herbal blossoms, and vintage-stitch wildlife are ready to add beauty and charm to your projects. 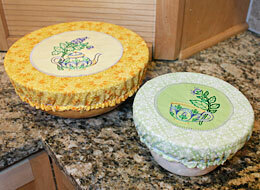 Spice up potlucks, parties, and everyday life with an embroidered cloth bowl cover. Click here for free project instructions! 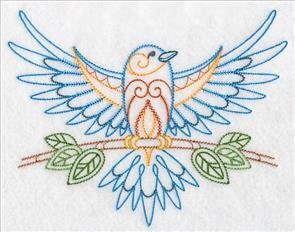 Shadow boxes filled with birds, butterflies, flowers, cupcakes, ice cream, and hearts bring all the best things in life to your embroidery machine. 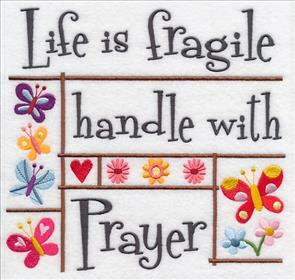 Words of wisdom dress up towels, tote bags, wall hangings, pillow covers, and quilts with cozy country style and sweet inspiration. 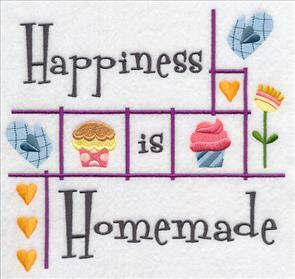 7.53" x 6.90" and 6.38" x 5.85" and 5.27" x 4.83"
Stitch an abundance of gratitude and happiness with these homespun designs. Perfect for housewarming and anniversary gifts! 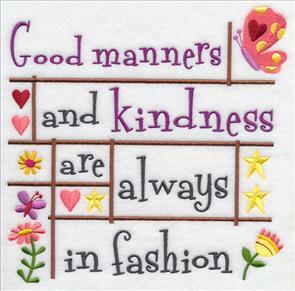 7.80" x 7.47" and 7.20" x 6.90"
7.40" x 6.90" and 6.28" x 5.85" and 5.17" x 4.82"
"Good manners and kindness are always in fashion" and "Life is fragile -- handle with prayer" are truly words to live by. 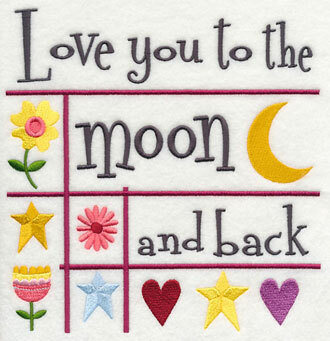 Stitch heartfelt sentiments onto quilts, towels, shirts, and more. 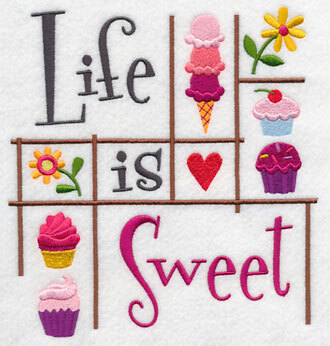 6.22" x 5.86" and 5.13" x 4.83"
Embroider a tasty philosophy onto tote bags and pillow shams to share a little of life's sweetness with your loved ones. Ice cream, cupcakes, and flowers make everything a little brighter! 6.90" x 7.33" and 5.85" x 6.22" and 4.82" x 5.13"
Whether you say "icing" or "frosting," you're going to whip up a treat with these deliciously delectable designs. 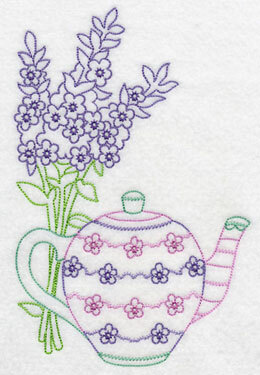 Embellish aprons, kitchen towels, and trivets for someone sweet. 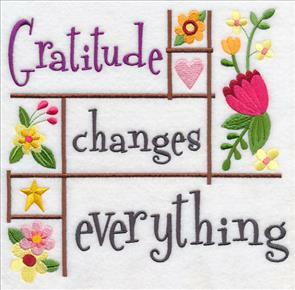 An attitude of gratitude makes every day a good day! 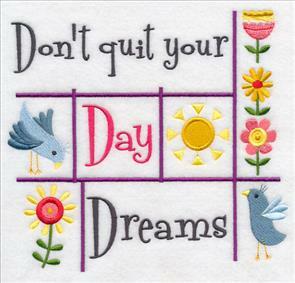 Dreamy on mini-quilts and pillow covers. 7.47" x 6.90" and 6.34" x 5.86" and 5.22" x 4.82"
Stitch a little cosmic love with this stellar design, and let family and friends know how you feel. Book bags are a fabulous gift for any occasion, and these bright designs are perfect for the square or rectangular shape of a tote. 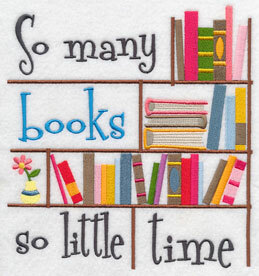 Make your favorite teacher, librarian, or bookworm smile! 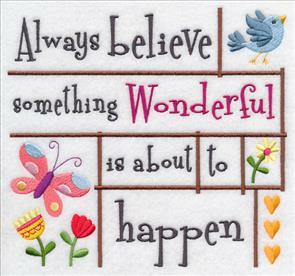 7.32" x 7.79" and 6.88" x 7.33"
Create decor and gifts from the heart with the Words of Wisdom Design Packs. Sweeten towels, tote bags, quilts, wall hangings, and more with these bright country-style designs. Order the designs individually by clicking the links above, or get the pack with all 13 designs. Four sizes are available to suit any project. 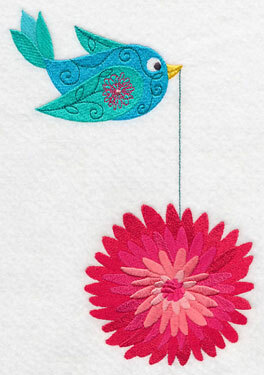 Tweet Autumn Flowers join the popular Tweet Christmas Ornaments and Tweet Snowflakes to add color and charm to towels, tote bags, table linens, and much more. 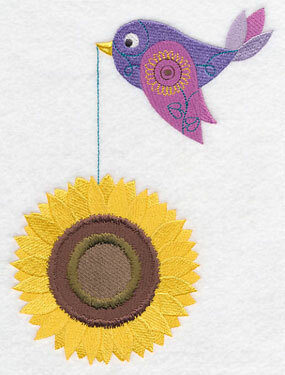 Each bird's flower is also sketched on its wing -- delightful for bird lovers and garden lovers alike! 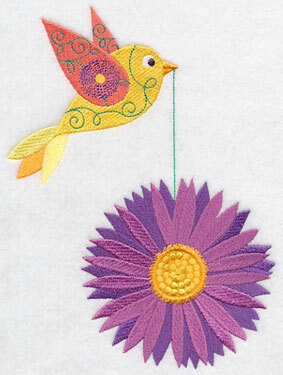 Below, birds carry a chrysanthemum and black-eyed Susan, bringing in autumn with style. 5.85" x 7.71" and 4.85" x 6.40" and 3.43" x 3.85"
Asters and sunflowers bloom long into fall, adding welcome color to gardens after summer's end. 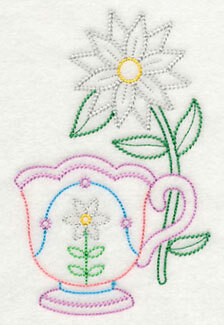 Let these hardy flowers blossom on your embroidery projects! 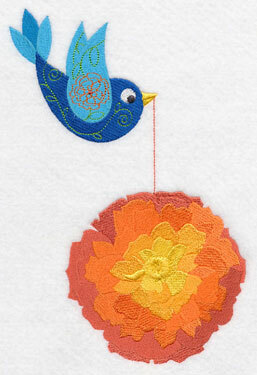 5.85" x 7.78" and 4.82" x 6.41" and 3.61" x 3.85"
Sweet birds soar with a marigold and a mum. 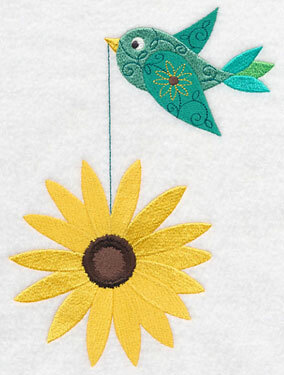 Towels, tote bags, wall hangings, pillow covers, and more are perfect landing spots for these bright designs. 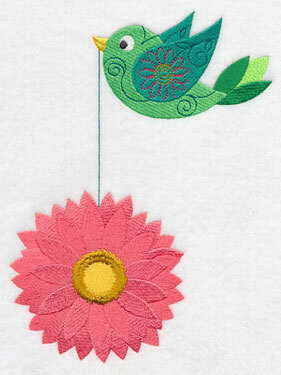 5.85" x 7.87" and 4.84" x 6.51" and 3.64" x 3.85"
Create a tweet autumn garden with these birds and their blooms! 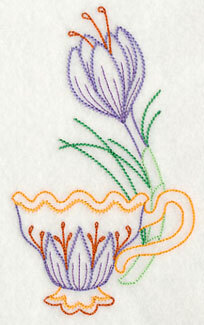 Plant on aprons, table linens, tote bags, pillow covers, and more for a unique and colorful seasonal look. 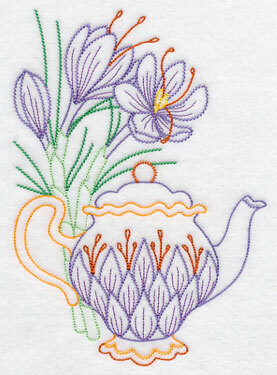 Something special is brewing, as delicate teapots and teacups are beautifully decorated with the fresh flowers accompanying them in each design. 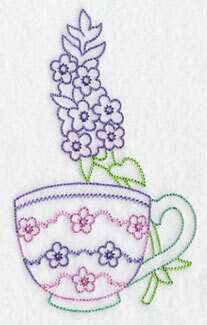 Relaxing herbs and blossoms create a soothing, refreshing compliment to each teatime serving set. 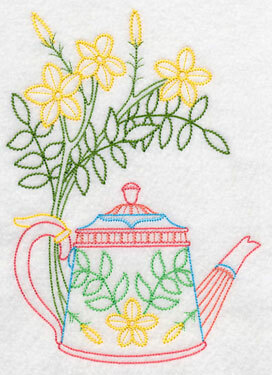 Add a saffron flower teapot and teacup to light towels for kitchen linens that are just your cup of tea. 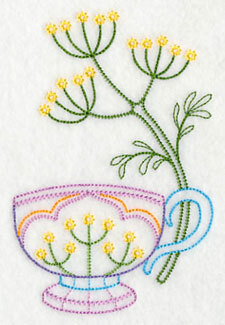 3.78" x 6.39" and 3.15" x 5.31" and 2.29" x 3.86"
Chamomile tea is comforting and soothing on any day. 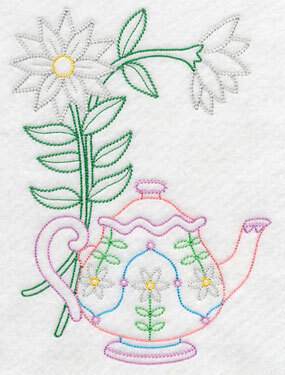 Bring serenity and a sense of peacefulness to your embroidery projects with this pretty pastel teapot and teacup pair. 3.52" x 5.42" and 2.93" x 4.51" and 2.13" x 3.28"
Mint is one of the easiest herbs to grow -- and to stitch! Add the strong flavor and refreshing fragrance of spearmint to flour sack towels, quilts, pillow covers, and more. 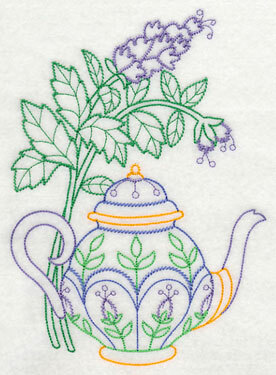 4.39" x 5.87" and 3.65" x 4.88" and 2.66" x 3.55"
Lavender blooms give a teapot and teacup a lovely look. Stitch your favorite tea sets onto tablecloths, linen napkins, placemats, and table runners for a fantastic blend of dining decor. 3.58" x 5.98" and 2.98" x 4.97" and 2.17" x 3.61"
Pretty in pink, marsh mallows give their name to sugary marshmallows. A treat made from the plant's root in ancient Egypt has evolved into today's puffy marshmallows. 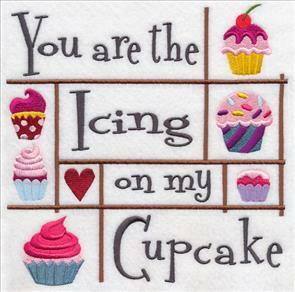 Very sweet on flour sack towels! 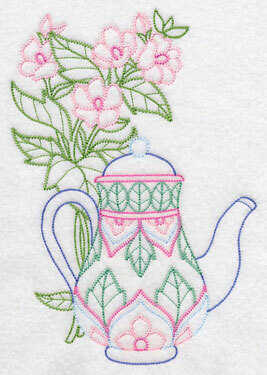 3.90" x 6.18" and 3.26" x 5.15" and 2.38" x 3.74"
Jasmine flowers bloom brilliantly on this teapot and teacup. Their distinctive fragrance makes jasmine a widely cultivated species of the olive family. Light and lovely on kitchen curtains. 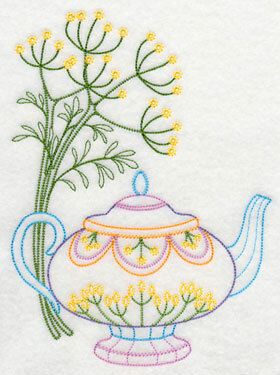 3.98" x 5.49" and 3.32" x 4.56" and 2.41" x 3.32"
Fresh dill decorates this delightful teapot and teacup. Perfect for spicing up kitchen decor! 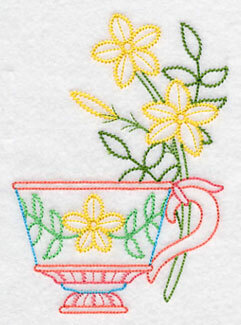 3.53" x 5.38" and 2.94" x 4.47" and 2.13" x 3.26"
A Time for Tea (Vintage) Design Packs give you all the ingredients you need for fresh table linens, kitchen towels, aprons, quilts, wall hangings, market bags, and more! Order the designs individually by clicking the links above, or get the pack with all 14 designs. Three sizes are available to suit any project. 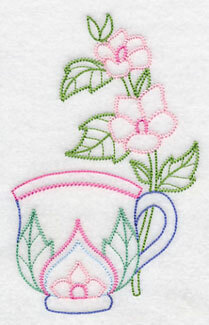 Vintage-stitch designs give a hand-embroidered effect with all the speed and convenience of the embroidery machine. 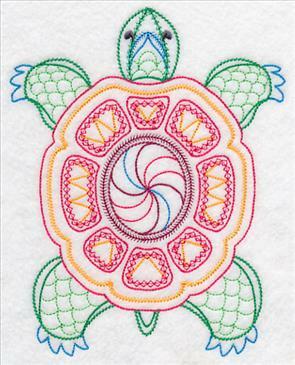 Low color changes and open areas make them fast to stitch while still creating impressively detailed embellishments on low-nap towels, quilts, table linens, shirts, tote bags, pillow covers, and much more. 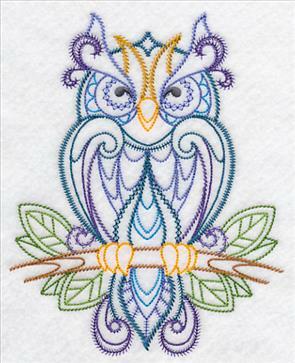 Bring a wild look to projects with a finely feathered owl and a turtle with a brilliantly colored shell. 5.85" x 7.37" and 4.85" x 6.11" and 3.06" x 3.86"
A bluebird spreads his glorious wings as he surveys the landscape, and a peacock proudly fans his tail. 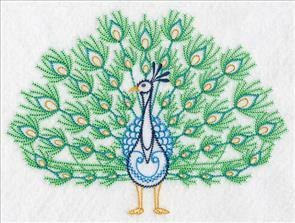 Let him shake his gorgeous tail feathers onto your next project! 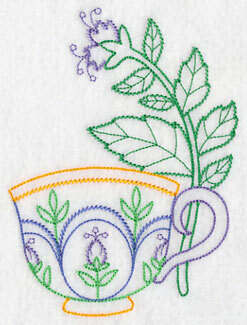 8.07" x 5.85" and 6.70" x 4.86"
Create a wildly colorful effect on flour sack and tea towels with these handsome designs. 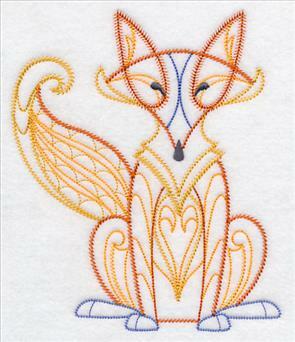 Energy flows from a buck's horns, while a fox leads with his heart and his head. 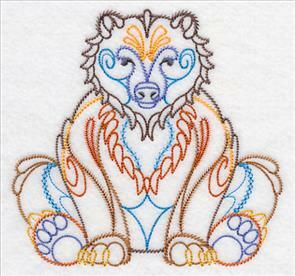 5.89" x 6.96" and 4.89" x 5.78" and 3.29" x 3.88"
A variety of stitch types creates depth and dimension in these vintage-stitch animal designs. 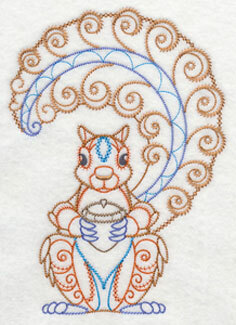 A bear appears poised to move at any moment, and a squirrel's tail is filled with energy. Add to shirts and jacket backs for uniquely stylish embellishments. 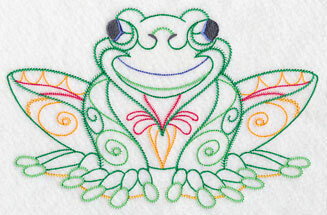 5.89" x 8.25" and 4.92" x 6.89"
Festive swirls and colors make this frog the most handsome amphibian in the pond. 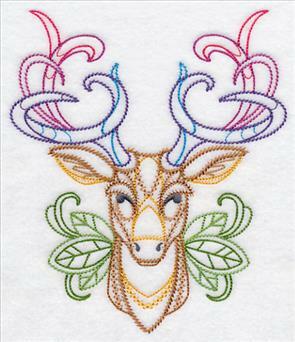 His good looks are perfect for livening up aprons, trivets, and low-nap towels. 9.07" x 5.88" and 6.89" x 4.49" and 3.87" x 2.55"
Look here each week for the Special Request of the Week, where one customer's design request is featured. 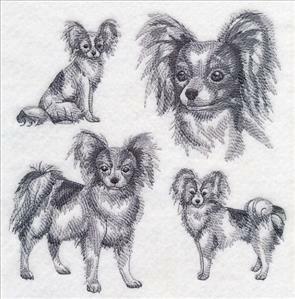 This week's request for a sketch and silhouette of the adorable Papillon is from Carolyn. 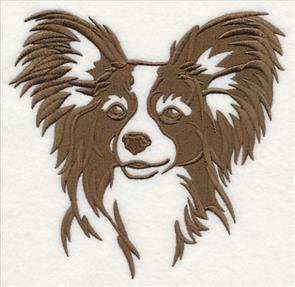 The Papillon is a friendly, happy dog with excellent social skills. Their ears used to only be droopy, but over time a type developed with erect, fringed ears that resemble the wings of a butterfly (Papillon means "butterfly" in French). Stitch this bright, curious dog onto tote bag, towels, pillow covers, quilts, and more! Thank you for the great idea, Carolyn! 7.57" x 7.78" and 6.88" x 7.06"
6.01" x 5.86" and 4.95" x 4.82" and 3.85" x 3.76"